Two of the new Serco Denholm fleet are seen in the Great Harbour, the Dutch-built tugs SD JUPITER and SD MARS. SD JUPITER arrived from Holland at the beginning of July, and has spent some to Faslane for trials and familiarisation. These two tugs are due to replace SD SPANIEL and SD HUSKY. 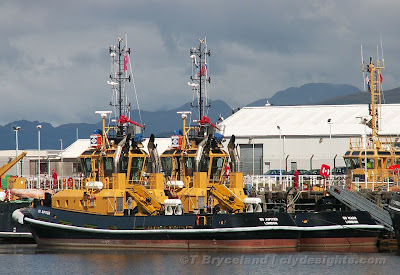 Nice shot T. Smart looking tugs ! Hope to catch up some day. Another 2 tugs to join the scrapheap challenge that Serco Denholm seems to be gathering at the Great Harbour.